The Tuareg are a nomadic Berber people who inhabit the Saharan regions of North Africa. Tuareg is an Arabic term meaning abandoned by God. The Tuareg who consider themselves white call themselves Imohag, meaning free men. Their language is Tamachek which is spoken by 6 million residents. The origin of the Tuareg , where they came from or when they arrived in the Sahara is unknown. They are nomadic, using camels for transportation and milk. In their early history, the Tuareg used the trade routes to transport salt and spices, and slaves. Unlike most other north African tribes, they are matrilineal. Women maintain prominent places in Tuareg society and maintain their own possession. The men are known for wearing a dark blue veil that covers their head, neck, and face which they begin wearing when they are young adults. For this, they’re called the Blue Men of the Sahara or Men of the Veil. The Tuaregs adopted Islam but still practice their animistic religion. In my debut novel HIS OBSESSION, the harem master – Tariq – is at the docks of the pirate Republic of Bou Regreg when captive Emmeliese Alexander arrives to be sold in the slave market. Determined to survive, Emmy who is descended from a Tuareg noblewoman convinces Tariq to take her into his master’s harem. Check out the super short excerpt below. Emmy started when the door leading to the master’s private apartment opened. 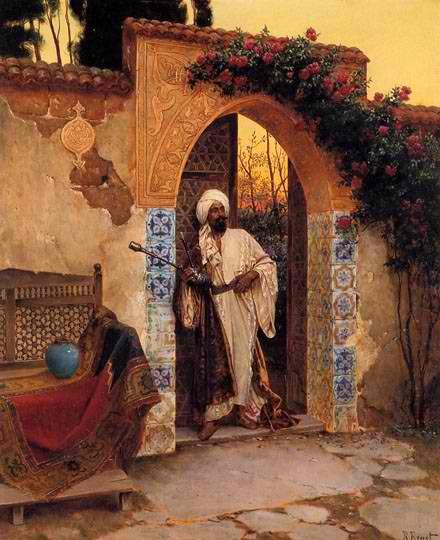 Tariq entered wearing a loose white robe and trousers with a jeweled dagger in the wide golden belt at his waist. She attempted to cover herself as best she could then hung her head while he surveyed her. The harem master was a darkly handsome, imposing man of mixed ancestry who had shown her kindness. When Aliya had explained the abuse he had suffered, her respect for him had grown. Not many in his circumstances would have extended a helping hand to a nobleman’s castoff. Emmy had spent the day preparing to be presented to the master. Following a long bath, Aliya had washed and brushed her hair to a golden sheen. While she recited poetry and sipped wine, the gentle woman oiled and buffed her body. Two weeks ago, she would never have let a woman touch her like that. Today, she was grateful for Aliya’s attentions and kindness.